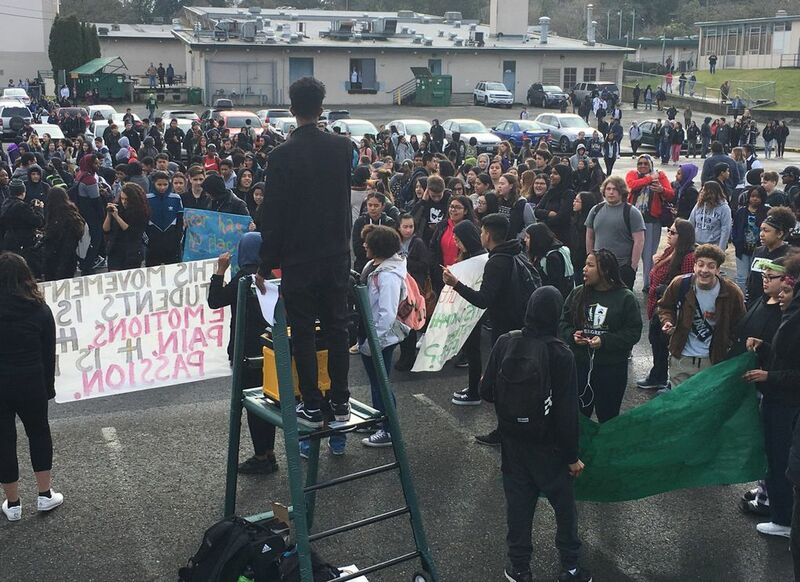 Students across the region joined peers nationwide Wednesday in the massive protest. 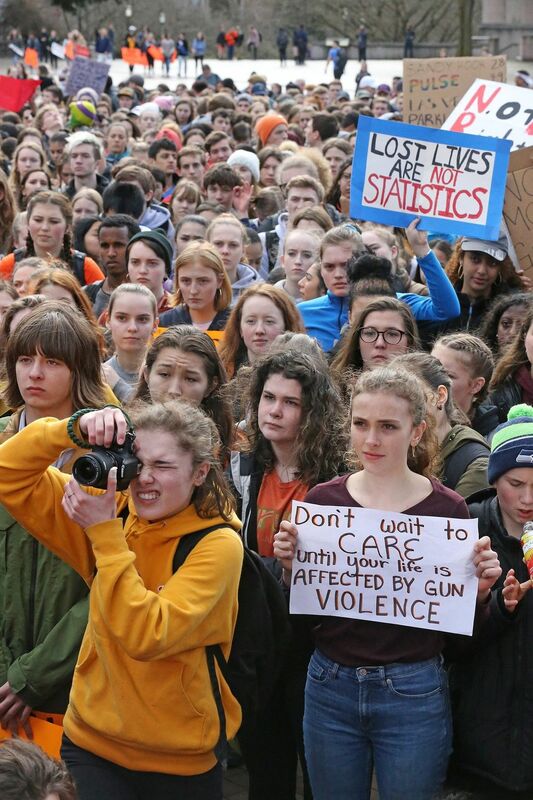 Most of the walkouts lasted about 17 minutes, in remembrance of the 17 people who were killed in the school shooting in Parkland, Florida, last month. 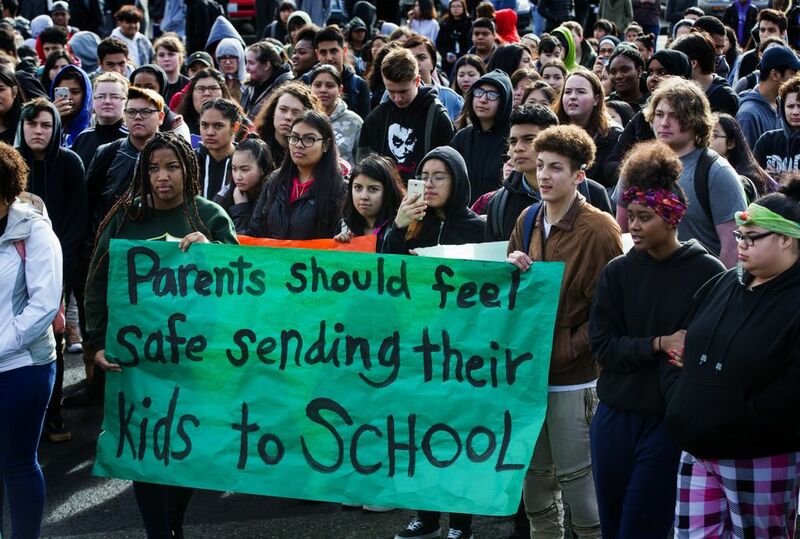 Thousands of Seattle-area students walked out of their classrooms Wednesday morning as part of the wave of protests across the country calling for stricter gun laws, one month after a gunman killed 17 people at a high school in Parkland, Florida. 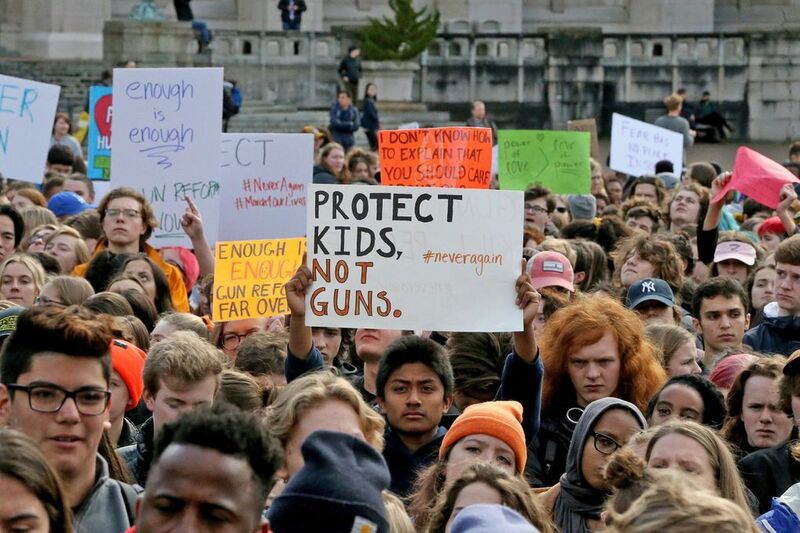 The protests were held nationally as part of the National School Walkout, which spanned time zones, starting at 7 a.m. Pacific Standard Time with walkouts on the East Coast. 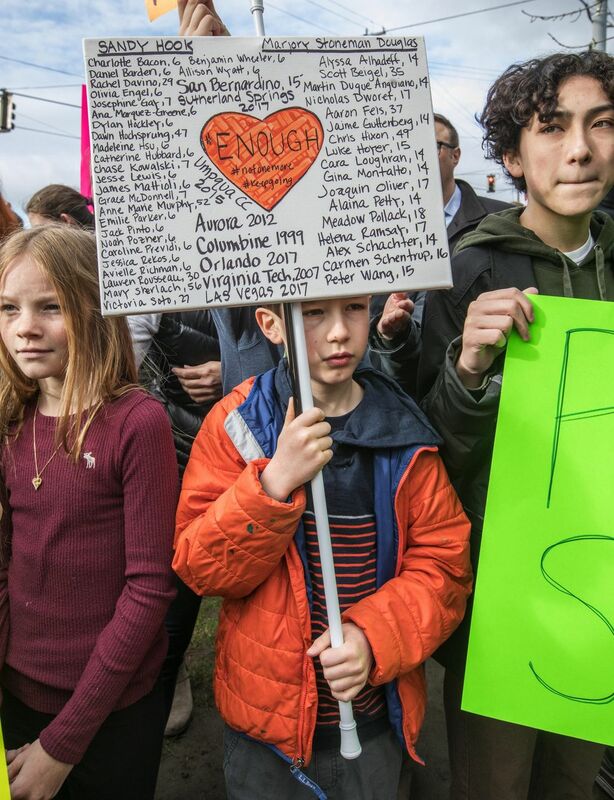 Students who have grown up in an era of lockdown drills and household names like Columbine and Sandy Hook filed out of their schools at 10 a.m. and stood outside for 17 minutes, memorializing those fatally shot at Parkland’s Marjory Stoneman Douglas High School. 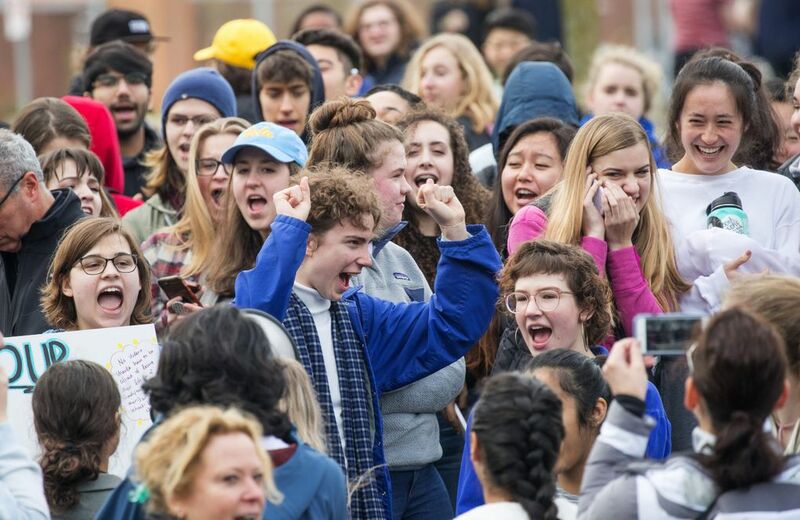 In the Seattle area, the details of each walkout varied, from elementary students who circled their building in a school-sanctioned demonstration to high-school students who left their school and marched for miles to a rally at the University of Washington. 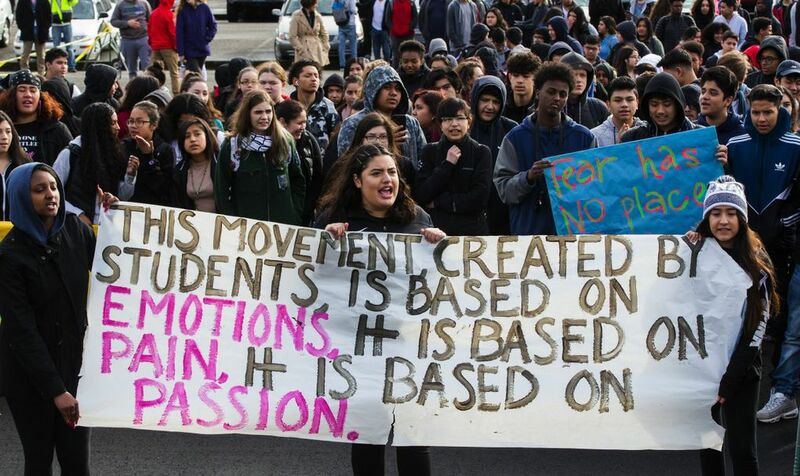 Many of the students say they were propelled by a belief that they — the nation’s young people — could make a difference. 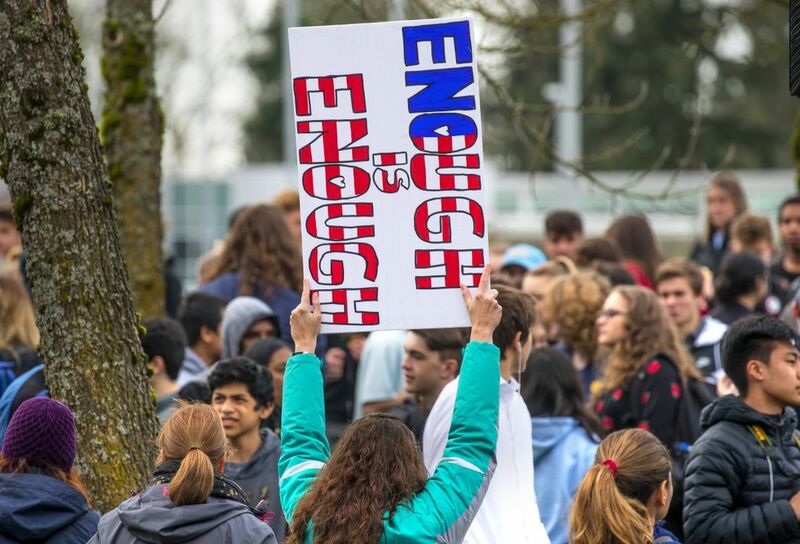 Jack Dingfield, a student at Seattle’s Bishop Blanchet High School, said recent events have changed his views of the gun-control debate. 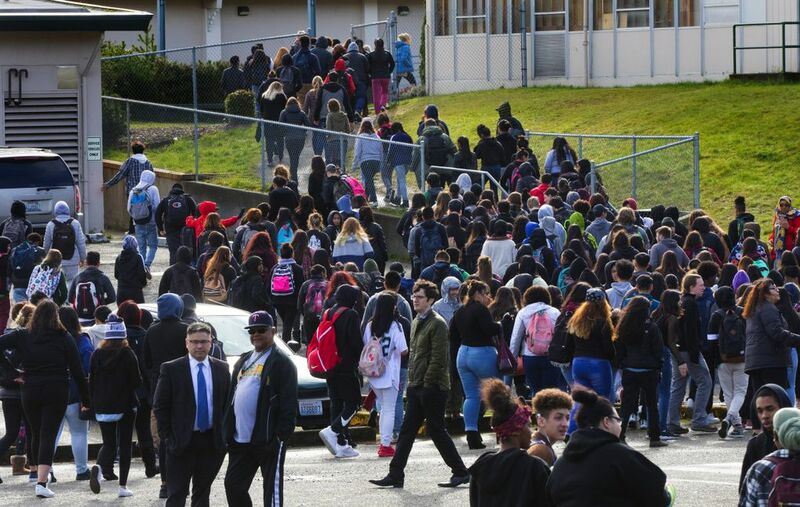 In early January, someone fired a bullet into a window at New Start High School, which is less than a mile away from Evergreen and Cascade schools. No one was injured when the round went through an office window and got lodged in a binder. 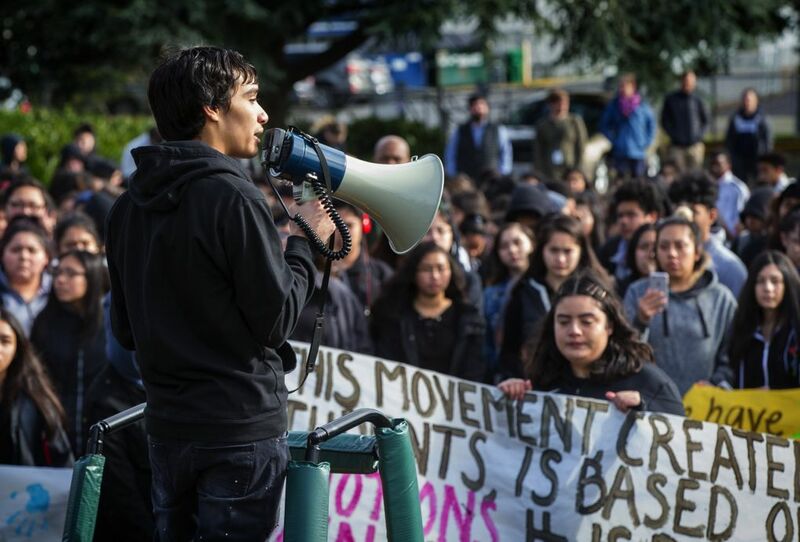 At the walkout, Evergreen senior Andrew Galan, 18, said he had friends who had been killed by gun violence. 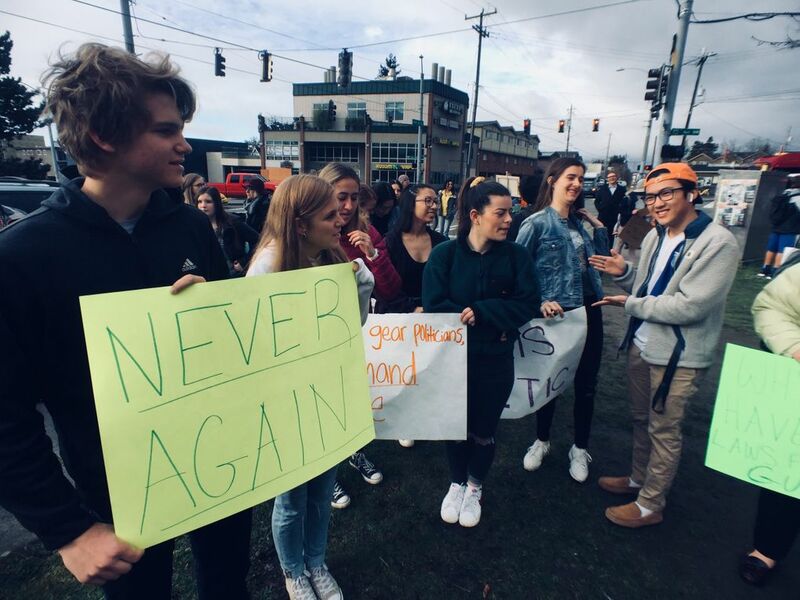 Evergreen junior Efrain Moreno, 16, spoke about how personal the protest felt to him, because he and his classmates are “protesting for our lives.” Seeing the videos from Parkland students on social media made the experience feel even more real, he said, and made him realize a shooting could happen at his school. By 10:30 a.m., the students were back inside their classrooms. District spokeswoman Tove Tupper said students who returned to class wouldn’t be marked absent. 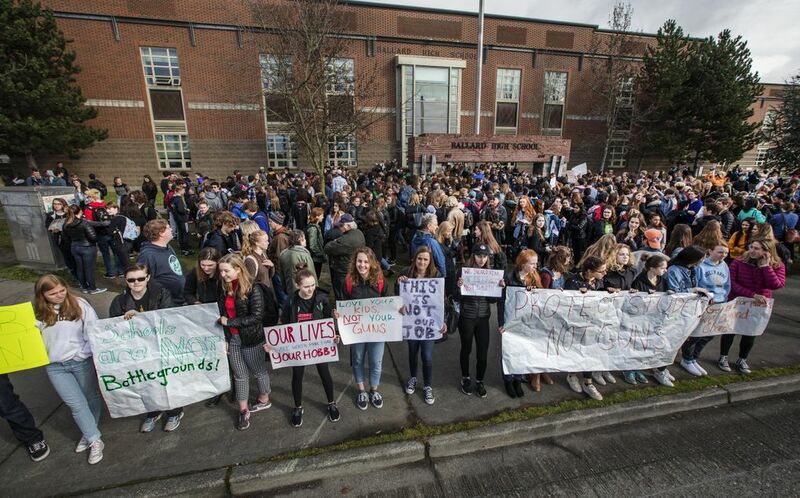 Shortly after 10 a.m., Lake Washington High School students began walking out of school in Kirkland. 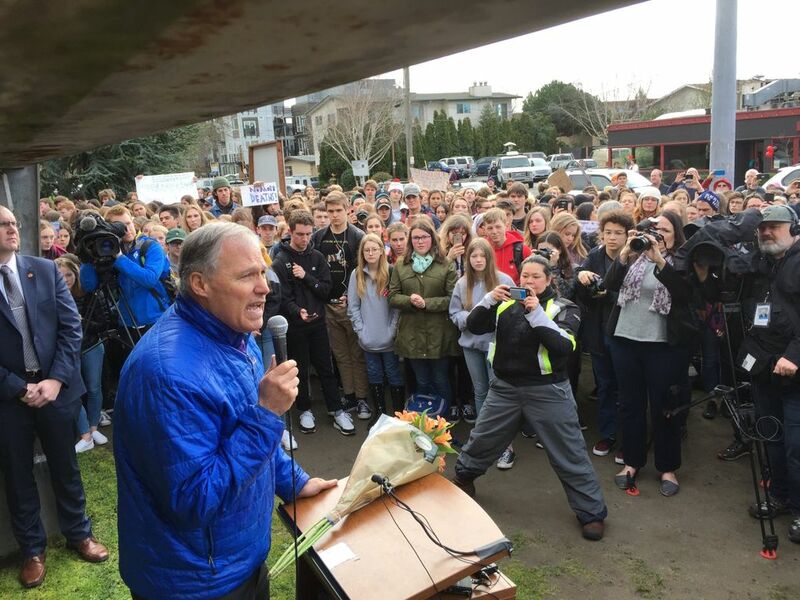 They gathered a few hundred feet from the school, and some students stayed indoors to call local lawmakers. Parents also showed support. 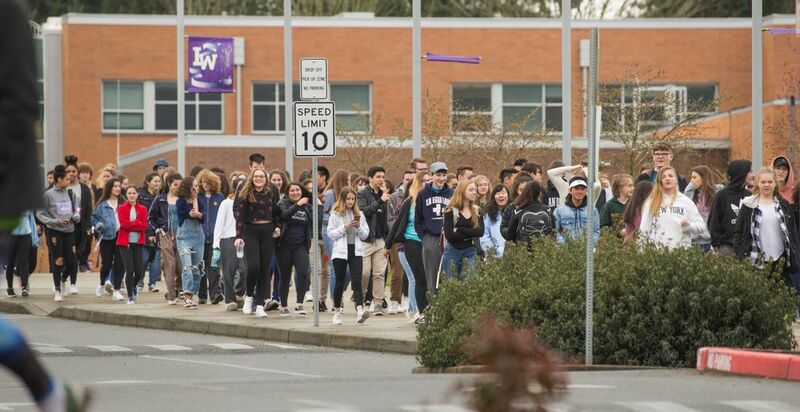 Gregg Eilers, 61, who has four children at Lake Washington High, and several other parents cheered students as they left the building. “This has awakened the activist in me that I was in the 1960s and ’70s,” he said. Students exuded a calm frustration. “I hate that it has to get to this extreme for this walkout to happen,” said senior Chandler Miller, 18. She, her younger sister Levin and fellow senior Morgan Zumwalt stood on the sidewalk a few hundred yards from the school during the walkout. 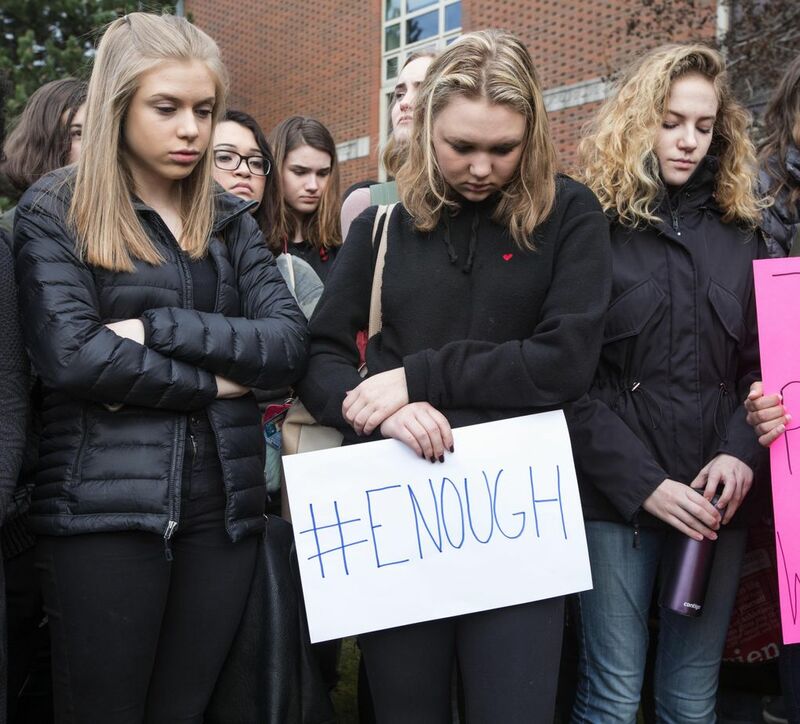 They shared that their school didn’t always feel safe. 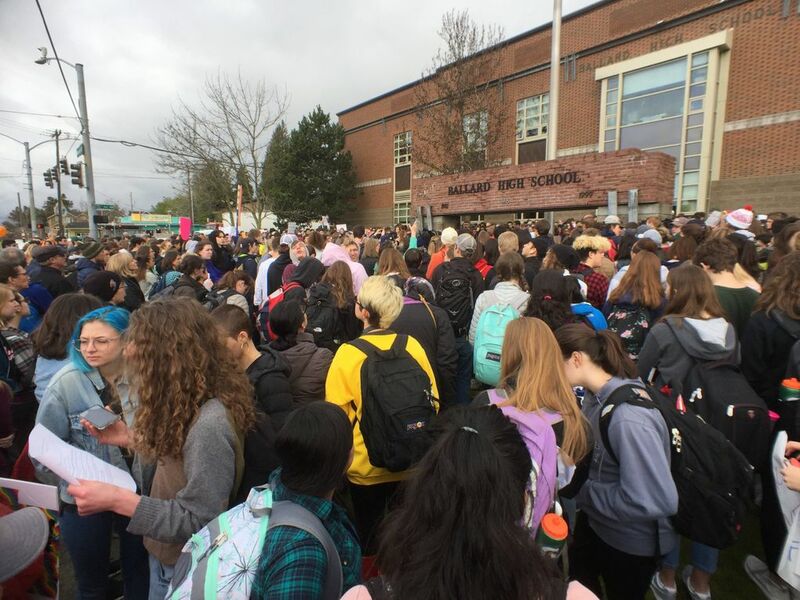 About 10 students, mostly seniors, organized Lake Washington High’s walkout. Some of them were first-time activists energized by the voices of the Parkland survivors. 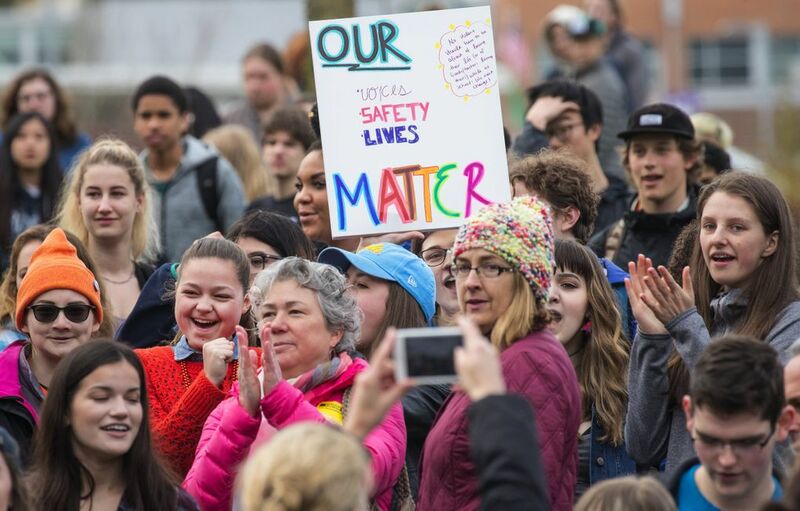 To spread awareness about the walkout, they banded together to approach the school administration, appointed students to do media outreach and printed flyers with contact information for local lawmakers. “Normally I’m not the one organizing these types of things,” said Alex Wilder, 18. “I think watching these students (in Florida) speak on a national stage after going through such trauma” had something to do with it, she said. 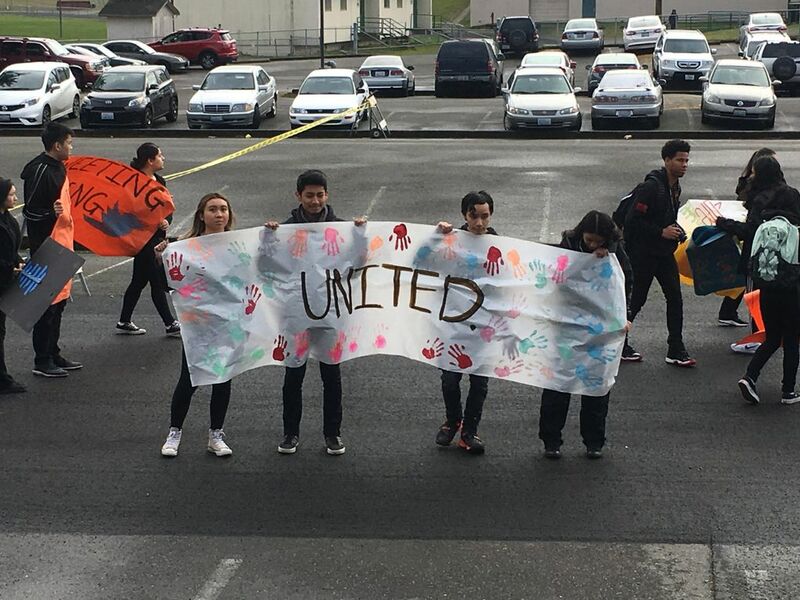 The school administration told the students they couldn’t endorse the walkout, but Wilder said “they’ve been as supportive as they can be.” The school rearranged its schedule so the walkout would take place during homeroom. And instead of an unexcused absence, students who chose to participate will receive a “tardy” mark. During the walkout, students got some approving honks from passing cars. Some students brought signs, but most huddled and chatted with friends. 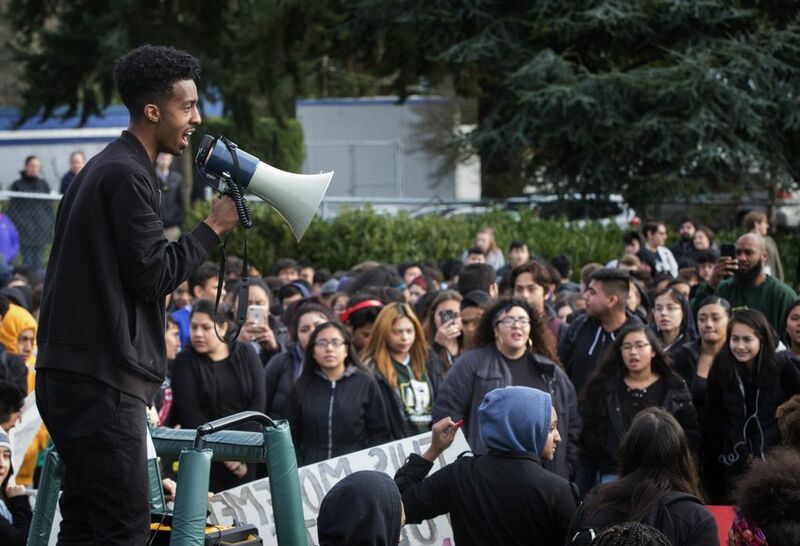 Toward the end of the walkout, student Sam Dorsey, another organizer, used a loudspeaker to encourage students to keep pressure on their local representatives. 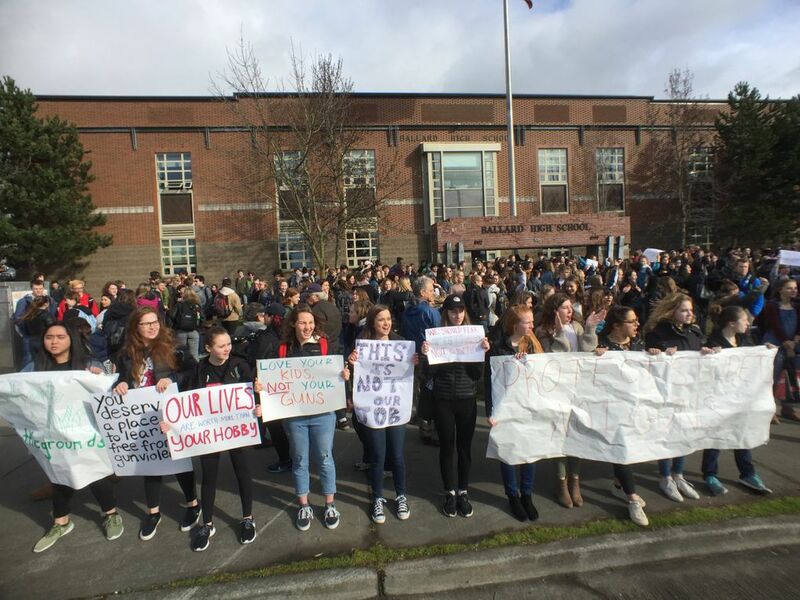 Ballard High junior Jade Macer helped organize the walkout at her school. Other students lined sidewalks outside the school as passing motorists honked. 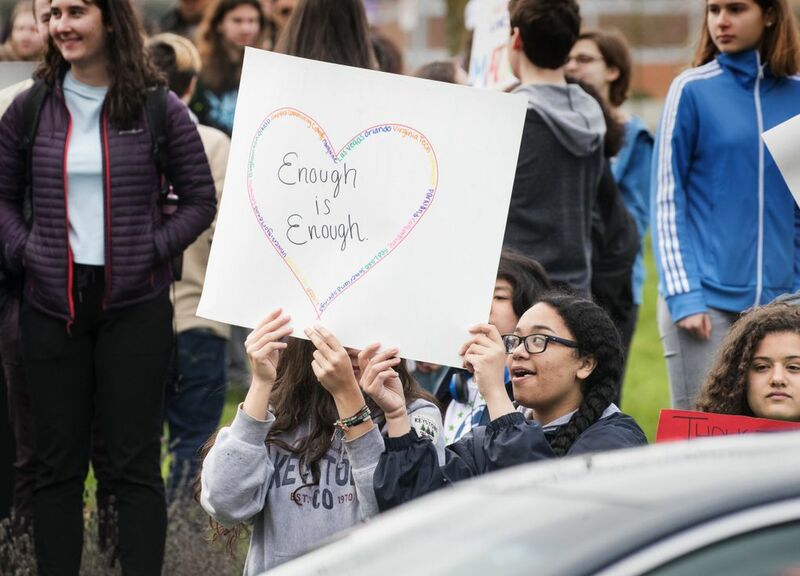 A few blocks away, students and teachers at Salmon Bay K-8 walked around their campus for 17 minutes, holding signs and chanting, as part of a school-sanctioned event. 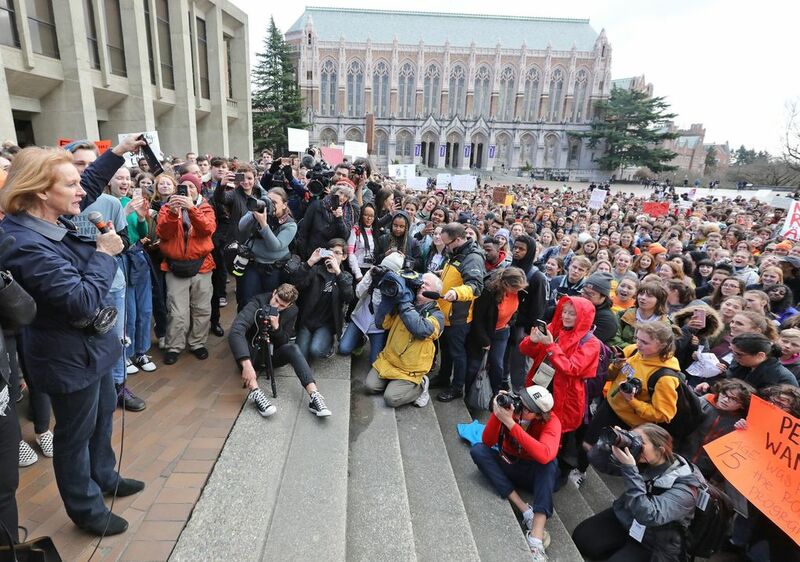 The protest’s sentiment was echoed at the University of Washington, where several thousand high-school and college students gathered in Red Square. 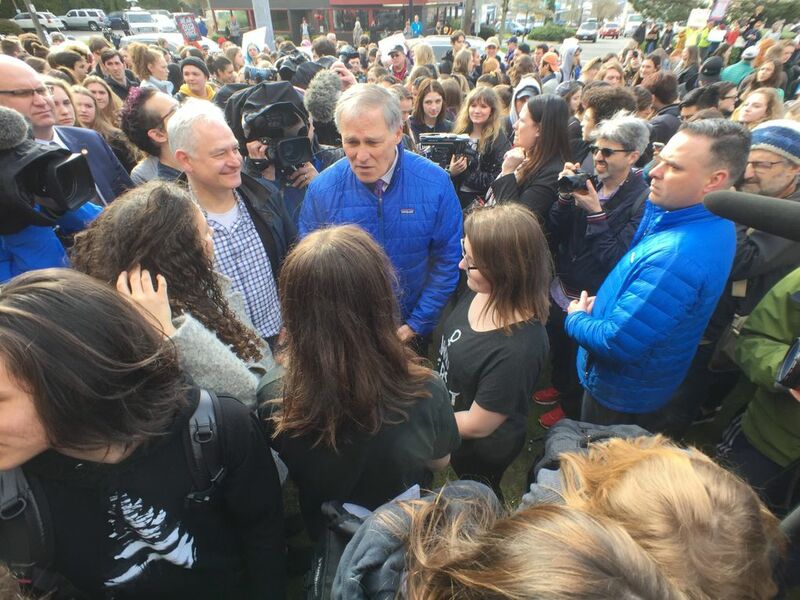 Students at Roosevelt and Nathan Hale high schools, University Prep, Seattle Academy of Arts and Sciences and the Bush School left their schools and walked to the rally, where they were met by Mayor Jenny Durkan and Seattle City Council members. 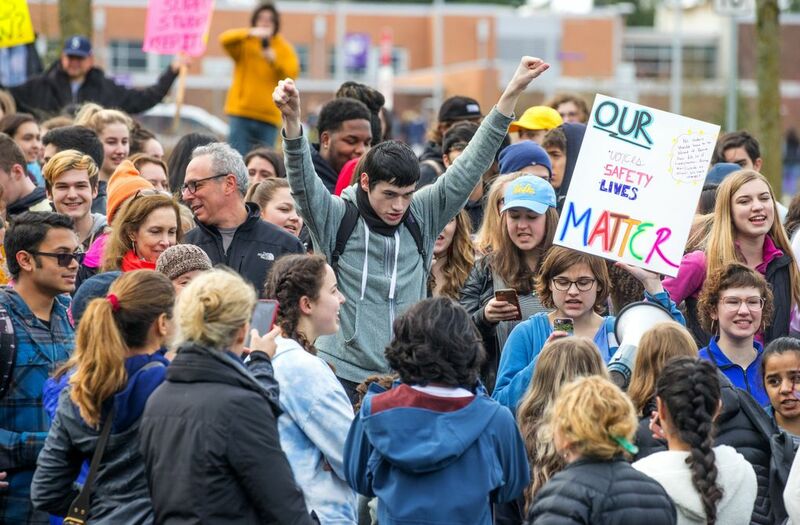 The student organizers had said they planned the march and rally to show that gun violence impacts all students, regardless of what school they attend. They also want to amplify their voices to call on lawmakers to pass stricter gun laws. People outside of schools also showed their support, like Swedish doctors and other medical staff, who held their own walkout. 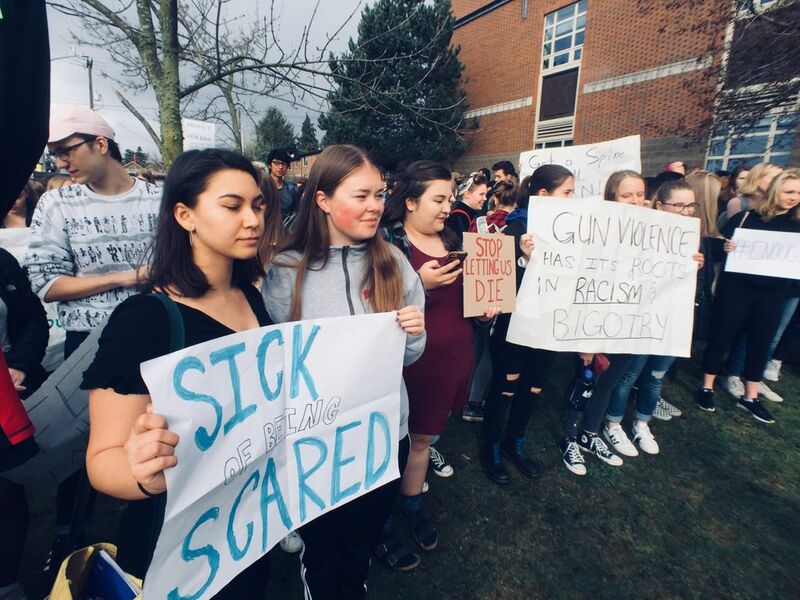 Correction: An earlier version of this story incorrectly stated that Lake Washington School District suspended classes last month at Juanita and Redmond high schools.